We have set ourselves a hard challenge with this month's selection of unusual and relatively unknown wines. Our first recommendation is a deep and complex wine, which surprisingly comes from a region more famous for the lightness and simplicity of its red wines. The second surprise on offer for you; we've found a fantastic wine at an affordable price from a renowned wine-making region with a reputation for high prices. And, finally, we propose an unfortified white wine, made from a grape variety more commonly known as the star behind sherry wines from Jerez. 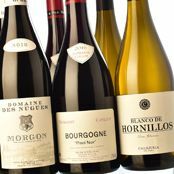 The Domaine des Nugues Morgon, Domaine Coillot's Bourgogne Pinot Noir, and the Blanco Hornillos from Callejuela are three wines which will offer you a special look at emblematic regions like Beaujolais or Gevrey-Chambertin in Burgundy, and the Marco de Jerez region. Humble at first glance, these wines will open a discrete secret door into a hidden garden of infinite aromas; violets and berries from the Gamay grape used for the Domaine dels Nugues Morgon, lavender and raspberries from the Pinot Noir used by Domaine Coillot, and the fragrance of chamomile and quince delighting us in the irresistible Blanco Hornillos. Once you yield to the seductive powers of these spectacular wines, you'll appreciate the beauty of this garden of aromas. But, try and keep our secret, this paradise isn't for everyone! Domaine des Nugues Morgon is a red wine created by Gérard Gelin, son and grandson of wine-producers, and owner of the winery from 1976 until his retirement. His son Gilles runs the company now and continues to produce this wine with the same dedication. It is made exclusively from Gamay grapes grown in the beautiful countryside around Villié-Morgon in the hills of the Beaujolais region in France. Densely planted vines, with about 10,000 plants per hectare, dig deep for water and nutrients in the sand, shale and clay soils. These vines are at least 35 years old and the hand-harvested fruit is very concentrated with yields of around 50 hl/ha. The bush vines are cultivated using sustainable methods and the grapes are vinified with the semi-carbonic maceration method so common in this area. The resulting wine has a deep ruby-red colour with initial aromas of jam and spices. A short time later, elegant hints of violets and fine smoke appear, alongside ripe black plums. It is silky in the mouth with a medium body and fine tannins. A taste of blackberries and bilberries is omnipresent, and aromas of woodland and scrub-brush provide more complexity, while its wild acidity ensures it will have a long life. Unlike the sweeter wines often produced in Villié-Morgon, the Domaine des Nugues Morgon maintains the essence of this appellation and the character of its soil, but under a long and elegant cape of austerity. For serving, the complexity of the wine is best appreciated with a 30-minute aeration. Production is limited to between 3,000 and 6,000 bottles depending on the vintage, so if you want to try this top quality Beaujolais, don't hesitate. The Coillot Bourgogne Pinot Noir wine is an almost-perfect balance between fruit, structure, and acidity. Its grapes come from vines growing in a privileged plot in Gevrey-Chambertin, one of the most prestigious winemaking villages in the Bourgogne region, and the wine reflects the character of this place. In the glass you'll see a bright ruby-red colour, and notice aromas of raspberries, cherries, lavender, and violets. It is quite warm and spicy on the palate, and refreshing hints of eucalyptus soon appear. Round tannins and a lively acidity make it an extraordinary wine either for drinking now or for keeping. It could be classified as a pleasant version of the Pinot Noir varietal, but with its own personality; the Coillot Bourgogne Pinot Noir has sufficient character about it to be recognizable as a red Burgundy, while offering the necessary delicacy to please most drinkers. Its silky, delicate, and subtle palate is perhaps its most seductive point. It offers discrete spicy tones, a measured wild acidity, and fine saline notes, rounding off a fully harmonious wine with fruit and sweet spices from its time spent in wood. Smoke, agility, and orange peel are also notable as you drink it, and lead us up to its long finish. A gastronomic wine ideal for pairing with a wide range of foods. More and more wines are being produced using classic grape varieties from the Jerez region (Palomino or Pedro Ximenez) but without fortification or aging under the yeast flor layer, as happens when making sherry. The resulting wines are both surprising and exciting. Wines such as the Blanco Hornillos from the Callejuela winery exude aromas of green olives mixed in with a fragile touch of grape flesh, hints of salinity, and soothing reminders of quince, or even pear. Tasting the dryness of the grape pomace, and creaminess of the yeast, you can imagine the white limestone soils of the area around Sanlucar. At the first whiff, you notice chamomile flowers blended with the modesty and honesty so characteristic of the Blanco family and the wines they produce. Their love and understanding of the secrets of these lands is the key for this winery to produce delicate wines with such a complexity. Subtle hints of honey, thyme, scrub-brush, pumpkin jam, pine resin, bitter almonds, and a suggestion of citric fruits, are all noticeable as you savour this unique wine.